2018 Senior National Open Chess Championship Kicks off in Jammu. Senior National open chess championship 2018 started on 8th December at Gurjar Desh Charitable Trust, Channi Himmat, Jammu. A total of 162 players from 27 states and 8 special units are participating including 19 grand masters and 20 International masters and some Arjuna awardee players. This is also a Asian Zonal 3.7 event as India is a separate Zone in Asia. Total prizes of Rs.20 Lacs will be distributed among top 10 players first prize being 5 Lacs. Mr Bharat Singh Chauhan, Chairman commonwealth chess association and also Secretary All India chess federation was the Chief guest on the occasion while Abdul Qyoom Chief Sports officer Jand K sports council and Ravi Singh Divisional sports officer were guests of honour. 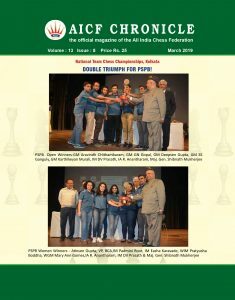 Bharat Singh Chauhan appreciated the quality arrangements by AJKCA and hoped that this event will boost the moral of Youth in J & K. In his welcome address Atul Kumar Gupta President AJKCA welcomed all the players in J& K and thanked AICF for giving them biggest National chess championship of India. Total 13 rounds will be played . International Arbiter Dharmendra Kumar is the chief Arbiter of this event who is supported by seven deputy Arbiters. Prominent guests present include Ashok Sharma sports Director SMVDSB , Munish Thappar Secretary Punjab state chess association and All J and K chess association members A.R. Wani, Ashiq Ahmed, Baldev Raj, Taranvir Singh, Kuljeet Jamwal, Farroq Ahmad, Mohd. Shafi, Khalid Amin, Raj Kumar, Vikas Nanda among others. Function was compered by Navneet Kaur.